Summary: This is at the value end of the range of recumbent exercise bikes for home use – and at the time of this review it comes with a significant discount at amazon.co.uk. You get a comfortable seat, along with a robust exercise bike which uses magnetic resistance to give you a cardio / fat burn workout. While sitting back in an upright chair adds to the comfort, it does not necessarily take away from the effort required to give you a good workout! The feedback from buyers of this model has been very positive, you can check that – along with the latest discount offer – over on the dedicated amazon.co.uk product page here. You’ll get a substantial piece of fitness equipment for your money with this home exercise bike. This is 120cm in length by 61cm wide and 84cm tall. Free delivery is included, which makes the 30kg total weight more manageable. When you see this model your eyes are immediately drawn to the comfortable seat with back support. This is not exactly an armchair, though you’ll find it a lot more comfortable than many regular exercise bikes which come with saddles. You can adjust the seat to get the right distance between you and the pedals, and to find the most comfortable position. Other features include over-sized pedals, and pulse sensors on the bars to the side of the seat. There are 8 resistance levels, these are controlled by a magnetic flywheel, which should ensure that the resistance stays smooth and predictable. Some setup of this model is needed, including getting the tension settings right. Most people found this simple enough, though as always when assembly is needed there were some previous buyers who did struggle with this. The XS Sports Recumbent bike has a battery powered onboard computer. This is basic, though covers all the important information. You’ll be able to track your speed, distance, time spent and pulse rate (via that sensor in the seat-bar). XS Sports Recumbent Bike – What Previous Buyers Said? 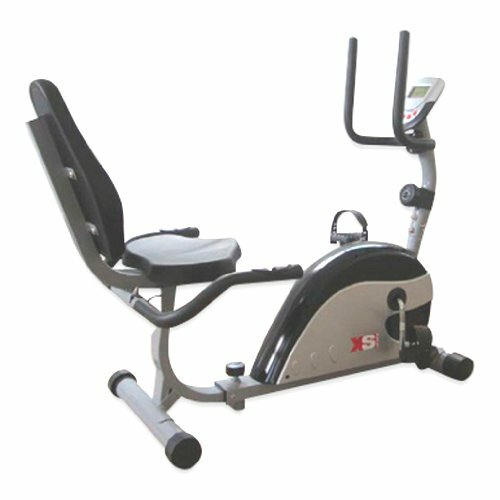 This model has more than 4 stars out of 5 (at the time of writing) which is high for any home fitness machine. Two things came through in the comments. First, most people found this easy to assemble – easy enough that they thought it worth mentioning in the comments. Second, that the bike was comfortable and sturdy. One commentor did note that this is a larger exercise bike – and that where it lives is currently under discussion with his other half! This XS Sports recumbent exercise bike is a lower priced model, and comes with a big discount at amazon.co.uk (as usual, this is ‘at the time of writing’, so do check the page). If you are looking for a solid recumbent bike, with pulse sensors, on board computer and variable magnetic resistance levels – then this could well fit the bill perfectly. The seating setup will let you work out in comfort – though you’ll still get a good cardio / fat-burning work out. Check the latest discount and buyer feedback for yourself now on the amazon.co.uk product page.